In the first article, we talked about the overwhelming evidence that a better and faster checkout experience contributes heavily to shopper’s overall satisfaction with a retailer and that by creating this experience, a retailer can differentiate themselves from their competitors. This article – the second in the series - focuses on determining your service promise and how to ensure it is being delivered. 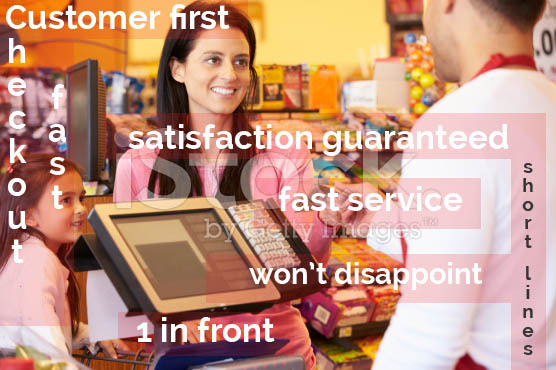 Retailers don’t want to disappoint customers by having long lines and wait times; that’s clear by their advertisements and mission statements – “fastest checkout in town”, “one in front”, “if there are ever more than 2 people in front of you, we’ll open another lane”, “unequalled service”, “personalized service”, “we promise to open all lanes during peak periods” and so on. The intent is there, but it is the rare retailer that consistently delivers on that promise. A common mistake retailers make in creating and then trying to deliver on a service promise is that they don’t have an accurate picture of their current service level. As stated in the first article in this series, traditional measurement techniques, such as customer surveys and mystery shopper are a great first step, but they don’t provide enough detail or fact-based information. So, when you make a service promise without knowing where you currently stand, you have no idea of the level of effort it is going to take to deliver on that promise – for some, you may have too many resources, for others not enough. As a result, to deliver you either spend too much labor or you don’t deliver at all. The Irisys Queue Intelligence™ management system provides continuous, 24-hour measurement of queue lengths, wait times, cashier utilization, under and over staffing and other key metrics. The system gives you a fact-based picture of your current service level (queue lengths and wait times). This allows you to establish your service baseline. Once this baseline is established, you can determine the level of service you want to target. One of the benefits of the queue management system is that it enables you to calculate the effort required to deliver your desired service level. For example: if you find that your average queue length is 3 and you want customers to experience a queue length of 2, the system will estimate the labor hours required to deliver that level of service. Service and labor have to be balanced; by having this data, you can determine what you are willing and able to deliver. The system then allows you to monitor store operations to ensure that service level is consistently delivered. When measuring companies’ current service level, we frequently find that their overall budgeted labor hours on the front end is close to what they need, but they are applied on the wrong day of the week or wrong time of day. Their workforce management system does a great job of forecasting based on historical transactions but doesn’t take into account the customer demand behind those transactions. The Irisys Queue Intelligence™ management system can help you determine your current service level, decide the service level you want to achieve, calculate the effort required to achieve it, and provide 24-hour monitoring to ensure it is delivered all the time.